This entry was posted on Wednesday, September 29th, 2010 at 5:00 am	and is filed under Culinary, Culture, Vegetarian Experiment. You can follow any responses to this entry through the RSS 2.0 feed. Both comments and pings are currently closed. My husband, just this past weekend, had to go into the hospital to work on a 600-pound man. He was so fat that they needed ultrasound technology to get a central line into him…I was just grossed out. And that’s not even the biggest one he’s gotten. A few years ago, there was an 850-pounder…they actually had to send the guy to the ZOO to get it done, because a normal machine couldn’t handle that much weight. Thanks for the recipes! I love getting new ideas to try out. I don’t suppose this is deserving of some of the comments that your more worthy topics elicit (choosing kindergartens, adoption, politics, etc.) but I would like to speak up for those of us who steam our vegetables. They taste fresher; they’re not oily; the color is better; and you don’t deplete the world’s natural gas supply by running the oven. So there. Jan–it all depends on whether you add butter, lemon juice, and salt and pepper. But in general, I’m with Gale…and Ina Garten, who roasts everything under the shining sun and passes it off as a new recipe. Now I will say, it’s a treat when someone (else) grills veggies. But I’m usually too lazy. To all you advocates for steamed veggies: You are holy, devout, and pure people. I think you must walk around with halos atop your heads. I don’t know how you do it. I can eat roasted or grilled veggies all day long, but not steamed. I do steam occasionally when my britches start getting a bit snug. But only then. For me, drizzled with olive oil and roasted is the more virtuous path, because if I steam my veggies I then want nothing more than to drown the little suckers in butter and salt, which totally defeats the purpose. Oh, and BLW – The pumpkin soup is embarrassingly fast and easy. Except for a little sauteing at the beginning, it’s basically a “dump and stir” recipe. I’m sure you can handle it. 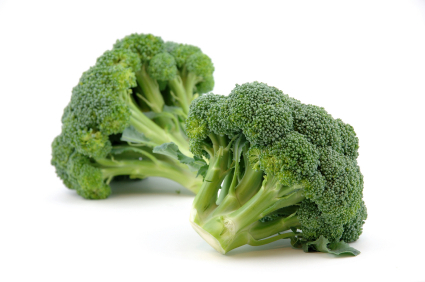 You just listed my all-time favorite way to eat broccoli! Roasted rocks! Roasted asparagus (olive oil and some garlic, salt and pepper) converted my (veggie hating) husband. He even ate it instead of the meat. Shocking! And any green does well with a simple sauté. So quick. Sadly, most of my veggies are frozen these days. It’s too easy. And the kids eat peas and corn. But salad is my favorite. With lots of garlic in the dressing. Lots. Or lemon juice, olive oil, a bit of garlic and a tiny bit of maple syrup. Yum.